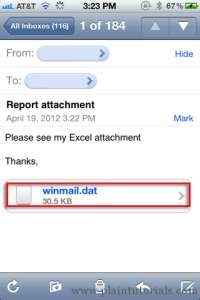 Ever had winmail.dat attached to an email, like below? Winmail.dat’s are created when Outlook sends an email in a format only Outlook understands, but you can still get your attachments with a little help from this website! Upload the winmail.dat file to the site and click send. The results page will list download links for your attachments. PreviousPrevious post:The Definitive Answer on Battery Charging!NextNext post:Do you need to use Google Apps with Windows 10, or Outlook 2016?